"Before suggesting change, one should have a rationale for making said change. My reason is simple. When the optimum solution for a plurality, if not an outright majority, of players when faced with a war dec is to either disband their player organization, leave their current corporation, or just not log into the game for seven days, then the game system is broken. The mark of a poorly designed game feature in an MMORPG is one that discourages or otherwise hampers social bonding. Industry-wide, the biggest indicator that a player will stay engaged, or in EVE's case subscribed, for a long period is having friends to play with. Those social bonds make leaving a game more difficult." The discussion of war declarations in EVE Online during the CSM 13 Summer Summit extended across the fourth and fifth sessions. The fourth session was dedicated to a discussion of what is wrong with the war declaration system while the startling statistics players are talking about occurred in the following session on the economy. In the actual session on war declarations, CCP let the CSM give their take on the mechanic before giving their ideas on how to fix the feature. We don't know much about CCP's ideas, apart from CCP Guard's idea of creating a giant mosh pit of combat or tying war decs to structures, but the CSM was not shy about giving their opinions. I should add that in the Executive Leadership session, the CSM had heard that the situation concerning war declarations was bad. First, the views of various members of the CSM about the current mechanics. Aryth: "Aryth says it's too cheap. The cost needs to scale based on duration, the issue is the workaround here would be to move to a new corp and declare the war again at the lower price." Brisc Rubal: "Brisc Rubal goes on to say that other games have war mechanics to offer PVP but eve is such a pvp centric game that this mechanic has become a niche mechanic which lies outside of the intended original design. He feels that this is not a mechanic which anyone would be happy with removing altogether, however it needs to become something that is useful and not just a means of griefing. Giving victory conditions to both sides. giving them both an incentive to fight is something which needs to trigger the end of the war." Innominate: "Innominate says the issue with War Decs is they can't be removed completely due to the high sec structures. Having war decs limited to corps with structures and adding victory conditions would be one way. Opting out completely would mean the corporations would only exist as a social structure." Jin'taan: "Jin'taan goes on to say that some entities do not necessarily want to use the war mechanic to camp station and catch people off guard. They would want to see more emergent game play associated with it, which the current system doesn't offer. Jin'taan also doesn't want to see 100 man corps with hulks being invulnerable to any form of attack through inability to war dec them or super safe high sec." Aryth: "Aryth brings up a king of the hill scenario as a new war mechanic." Brisc Rubal: "Brisc Rubal speculates that the war mechanics are heavily tilted towards the attacker and CCP Fozzie says this is indeed the case. Brisc Rubal doesn't expect any version of it to ever become fully even. He asks if the ratio being closer would be a favorable goal for a new system." Innominate: "An example is mentioned: An industrial player undocks from Jita and gets attacked by 5 war deccers and their logi alts. This makes Innominate point out that assistance from those who are not party to the war needs to be addressed." "Innominate feels a great wardec is two groups of equal sizes fighting and not playing 'deaggressing games'." Jin'taan: "Jin'taan mentions war objectives which can be achieved"
"Jin'taan suggests a goal being ships killed. This encourages docking and The Judge is curious to know what kind of community this would spawn." "Jin'taan suggests a propaganda structure to be deployed on other structures to declare war, the structure would be expensive and be worth destroying, clustering them together would also mean that they gain attention and would be destroyed by null blocs." Sort Dragon: "Sort Dragon brings up an invulnerability of some kind to avoid a permadec, such as paying a fee of some kind. He feels that there never comes a point where newbro corporations can catch their breath after an initial war before the next war comes along." "Sort Dragon mentions the idea of using propaganda structures as a means of ending the war in the form of a victory condition to end the war." Sutonia: "Suitonia feels that it needs to be tied more to structures, and that there currently there is no real way to retaliate against a corp that war decs you." While getting the recorded thoughts of the members of the CSM is worthwhile, I believe CCP's thoughts are critical. First, CCP Fozzie's summation of the situation around war declarations, with details following. "CCP Fozzie goes on to clarify that the metrics for the current system clearly show that it's in a state that CCP is not happy with. The current system is extremely skewed in the favor of aggressors. There is also the fact that people involved in wars will simply not play whilst the war is ongoing. They also want to see a scenario where the defenders who may not normally be interested in wars would engage in them as they see a clear scenario where they can get a victory condition and end it." All of the concern for making a change in war declarations for new players, at least in CCP's eyes, falls under Malcanis' Law, "Whenever a mechanics change is proposed on behalf of ‘new players’, that change is always to the overwhelming advantage of richer, older players." "Lebowski brings up the data which shows that it's not actually a lot of brand new players that are being war decced, because they are not worth declaring war on most likely. Typically it´s more established corporations that get hit once they are big enough to be a target. This does however still affect new players such as in Karmafleet, Brave Newbies and so on indirectly through which corporations are being decced." The CSM countered with the claim that CCP should analyze the players affected by the war decs, not the corporations. So what is CCP planning to do to fix the war declaration system? The information falls under the infamous Non-Disclosure Agreement. Probably a good move, because I am sure CCP came up with some pretty hideous ideas in addition to practical ones. CCP created the Council of Stellar Management for situations like this one. Hopefully the CSM will keep CCP from falling too far into a bear trap. @noizygamer hey, something happening on ebay, most of rmt offers are gone for some reason. Do you knoew anything about it and, maybe, it affect black isk prices? Just a quick detour away from the CSM summit minutes now that I have some secondary (aka black) market numbers in for the third quarter. Sometime in Q3, probably in July, eBay stopped allowing people to sell virtual items from video games on the site. Aspector asked whether the move had an effect on the price of ISK. As far as I can tell, the ban on eBay just meant that sellers shifted to other platforms. 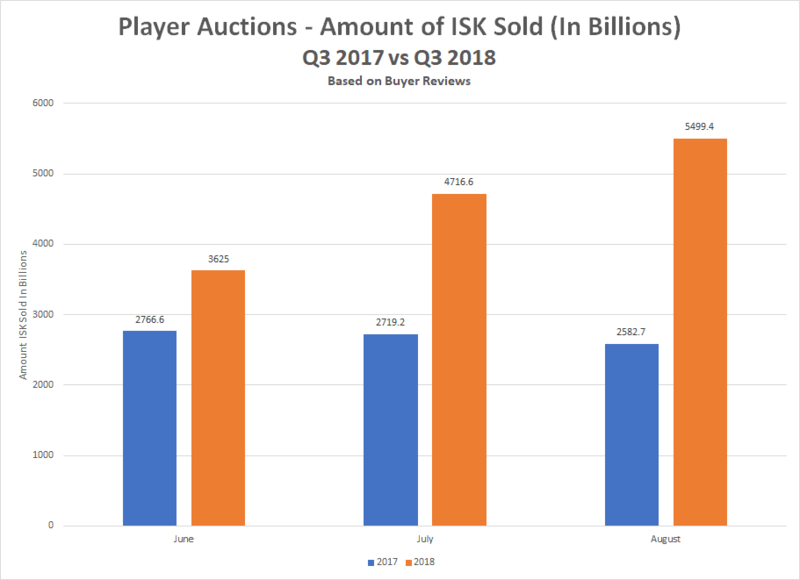 The crooked hockey stick in the graph above is a result of the move, with the volume of sales jumping in the third quarter of 2018. The virtual currency site Player Auctions was a beneficiary of the crackdown on sales on eBay. As the chart above shows, sales declined in the third quarter of 2017, reflecting the traditional decline in activity in EVE during the summer. 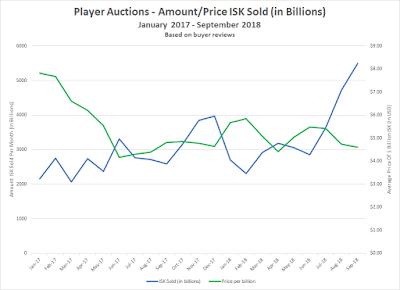 If I am correct about when the purge on eBay began, that means sales on Player Auctions jumped from 2,806 billion ISK in June to 5,499.4 billion ISK in September, a 96% increase. Normally I would compare the same period in 2017, but the massive sell-off ahead of the bans related to ghost training at the end of June 2017 really distorts the picture. 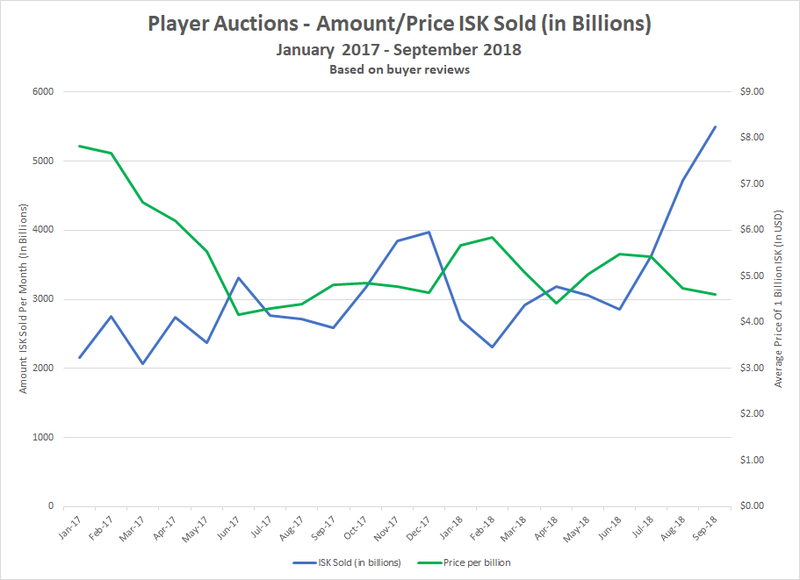 Just to make sure that a crazy price shift didn't create the increased demand, let's look at the price of a billion ISK. In 2017, the price of ISK rose by $0.60/billion ISK, or 11.6% from July to September, with a decrease in sales of 6.6%. 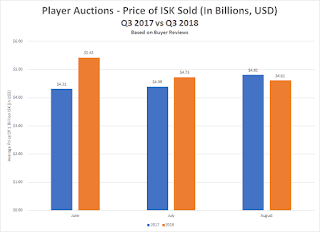 In 2018, the price of ISK dropped 15.1% in the same period, with and increase in sales of 51.7%. Doesn't sound quite right, does it? I then calculated the price elasticity of demand. The price elasticity formula indicates the expected rise in the demand of a product for a 1% decrease in price. 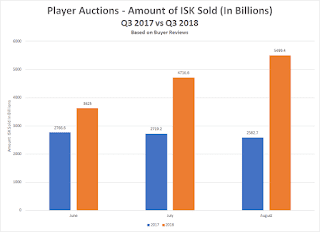 All else being equal, in 2017 a 1% decrease in price of 1 billion ISK resulted in a 0.63% increase in demand. In 2018, on the other hand, a 1% decrease in price produced an increase of 2.5% in sales. In 2017, ISK was very inelastic. In 2018, very elastic. Even assuming that a 1% decrease in price normally resulted in a 1% increase in sales, that leaves other factors causing the other 60-70% in increased sales. The major factor was the ending of RMT sales on eBay. I'm not sure exactly what caused eBay to begin enforcing their terms of service concerning virtual item sales connected to video games again. I can say two things, though. The first is that the price of black market ISK wasn't as affected as much as where ISK sellers hawk their wares. The second is I no longer have a good (or even mediocre) sense of how big the RMT market concerning EVE Online is anymore. Removing such a large platform for RMT sales really screws up my existing calculations. The second session of the CSM summit, "EVE Leadership Team", basically had no minutes recorded, so I will instead review the third session about Abyssal Deadspace. The two CCP employees who show up in the minutes are Creative Director CCP Burger and game designer CCP Rise. As in the first post in the series, I will rearrange the order of the subjects discussed in the session to fit my personal sense of order. The big question is about the adoption rate for Abyssal sites. CCP is happy with the numbers currently running the sites but would like to see the numbers increase further. Players who run the sites on a regular basis are "healthier customers", with behavior metrics showing a dramatic increase in several important areas. This in spite of player criticism of the risk vs reward balance. One other experiment was mentioned, turning off the suspect flag for tier 4 and 5 sites. Since the CSM seemed extremely interested in the results, I'll just copy/paste from the summit minutes. "CSM starts by asking how turning off the suspect timer affected the activity in abyssal sites, it resulted in a considerable increase but also was around the time of the Secrets of The Abyss event so hard to accurately differentiate. CCP Rise shows the CSM some metrics but it is noted the event is probably the bigger cause for the spike in activity rather than the suspect timer. A survey shows that the suspect flag was low on the list of reasons not to run them. The more common response was difficulty and cost for fits. Rewards versus investment was also a large factor factor." CCP Rise disclosed that the difficutly of running tier 4 and 5 sites is about right, but he is looking into opening up the lower tier sites to newer players. CCP is looking into giving fits and fitting advice to new players, although Jin'tan has a concern about fits for lower level sites not being visible. On the other hand, adoption of Abyssal technology by players is falling behind hopes or expectations. Precursor (aka Triglavian) ships are used less than CCP Rise wants. The upcoming changes to the Damavik (giving it a third mid-slot) is one response to the situation. The ships are also more expensive than CCP Rise would like. CCP Burger asked if Abyssal modules are used in fleet fights. The CSM replied no, giving several reasons. The Judge pointed out that alliances almost never include Abyssal modules in their reimbursement programs. Killah Bee stated that fleet commanders prefer ships in their fleets have uniform fits so they know the capabilities of their fleets. Sort Dragon also noted that Monitors, the special ship developed for fleet commanders, tend to use Abyssal modules more than any other ship in fleets. The consensus of the CSM is that Abyssal modules work well in small gangs, but won't change the meta used in the clashes of the major alliances anytime soon. Possibly one of the biggest questions concerning the Triglavian content concerns the uses of mutaplasmids. CCP Rise asked about creating a new ship mutaplasmid and the CSM thought that a good idea. The CSM also asked about the most frequently mutated modules. While the minutes don't mention which ones, we do know the tech 2 varieties and the most commonly rolled. Finally, the discussion on the subject turned on what to do with bad rolls. Options ranged from reprocessing to recycling them to obtain some type of residue one could turn into a currency or loyalty points. Nosy's take: I've run the Abyssal sites, even losing a Vagabond in the process. I don't have much to add to the conversation, except to note that if the Triglavian technology ever becomes accessible on a massive scale, we will see the major null sec alliances take a greater interest in the subject. For now, I'm happy that the feature is working well and CCP plans to iterate on Abyssal deadspace sites. Update 6 October 2018 - Jin'taan had ideas about co-op play in Abyssal sites. At the G-Fleet meet, CCP Cognac announced that co-op play involving 3 frigates is now on the Duality server. Yes, I am blatantly ripping off Dirk MacGirk's description of the CSM 13 Summer Summit since CCP Guard gave the minutes the wrong title. The minutes are now out and I plan to review all 53 pages while I sit on the train commuting back and forth from work. As I get older, I find writing about something gets the topic stuck in my brain. Since I land in Las Vegas in two weeks, I probably need to hurry up and write so I can get the most out of my opportunity to bug the developers. For these summit minutes, I will go through and give a summary and my thoughts on each section. Don't worry, I will break up the review into multiple blog posts. With that disclaimer out of the way, let's begin. Summit Welcome - Our representatives on our internet spaceship council seemed eager to get to work as the initial meet-and-greet session turned to business. The minutes went in chronological order as good minutes should, but I'll list the contents in order of importance. Your judgement may differ. First, the CSM believes that the game needs incremental changes rather than Jesus features at this time. Sort Dragon and Jin'taan both argued for incremental changes over new large features, with Brisc reminding people that CCP can work on both at the same time. Suitonia chimed in with recently added small changes such as the HAC and AF balance changes and the Muninn change that were well received. Nosy's take. CCP is an Agile shop and should, with enough resources, have the ability to work on both. However, working on an MMORPG like that is relatively difficult. I wouldn't have used Wizards of the Coast as an example, as Jin'taan did of multiple teams. I would go with ArenaNet's three teams that worked on the 1st season of the living story. As I recall, they pretty much burned themselves out. However, I don't think ArenaNet was an Agile shop at the time. "Sort Dragon talks about the lag in the game and conflicting ideas about what the cause is. The cloud is brought up and what services could be brought into the cloud to take load off TQ. There is some chatter about which teams are involved in this topic, and who would be in the meeting specifically about server stability. The talk moves over to distinguishing lag, client issues, crashes and fleet fight system performance as these issues are varied and can be caused by different scenarios. The tether system is brought up as a potential cause of the performance issues in flights." The bounty system seems a strange topic to make a priority, until one thinks about the affect the system has on large fleet fights. Sort Dragon asked if CCP could just remove the feature altogether. An appeal was also made to the affect receiving a bounty has on new players, but that sounded like Malcanis' Law coming into play. Other topics related to new players were providing an improved default overview for new players and a warning about putting too much into a hauler. The CSM argued that the current default overview was inadequate to complete the tutorial. As for the hauler, keeping a brand new player from getting all his belongings wiped out in a high sec gank is not optimum for player retention. At the bottom of my priority list of subjects discussed in the opening session of the summit involved client issues. Sort Dragon asked about localized clients, specifically whether a Chinese client would become available to players on Tranquility. He also asked about other languages, specifically Japanese and Spanish. Jin'taan also brought up the subject of allowing limited modification of the client itself. Given the history of players hacking the client to do nefarious things like make themselves not appear in local, I'm not sure how much acceptance of the idea inside CCP would gain. Nosy's take. Very interesting. One has to take into account the dominant representation on CSM 13 of the major null sec alliances when looking at the priorities. The overarching goal of CSM going into the summit was server stability. I would consider the bounty system as part of the server stability issue, as the system puts extra loads on the servers during large scale fights. The issue of developers playing their own game, or lack thereof, is an old theory on why some things never get fixed, or the wrong solution is implemented. But the war dec system? That's definitely looks like a high sec issue. However, I understand that Crimewatch also affects server performance in big fights. Perhaps I'm to cynical, but that might have something to do with the interest amongst some members of the CSM. This concludes my review of the minutes of the first session of the summit. Reviewing all of the minutes promises to take several blog posts. I figure by the time I finish the summit will have faded from the headlines in the EVE media. But I figure I should still put in the effort to understand what CCP may intend for the future. CCP Falcon put out a little article today that had some big news. The first little bomb EVE's community manager dropped is that CCP will run the Serenity server. I thought NetEase would have to either host the Chinese cluster themselves or find a third party company to provide the service. Apparently not. Another change that will impact players more directly is that the Singularity test cluster will host both changes for the Serenity cluster as well as the Tranquility cluster on which the rest of the world plays. CCP Falcon explained the details of the move. "One of the key aims of our partnership with NetEase is to ensure that Tranquility and Serenity stay as close to parity as possible in terms of content, and we aim to be in a position where Serenity is either running the same release as Tranquility or is one release behind. "This means that as of today, with preparations for the re-launch of EVE China, Singularity will begin to host content destined for either, or both servers. "This will include SKINs, localization and monetization features that are destined only for Serenity, along with changes to the client that are required to comply with Chinese law. Changes to the launcher and client that need to be made because of Chinese law will however only be active in the Serenity packaged version of EVE." I'm not sure, but I think the Chinese government has to approve any software upgrades in video games to make sure they conform to approved standards. One standout example was the delay of the release of Wrath of the Lich King to the Chinese servers until Blizzard could remove all traces of skeletons. But maybe CCP has some connections. I'm looking forward to my next trip to Singularity, if only to see some of the SKINs TianCity sold in lieu of implementing Alpha clones. The only thing I'm not looking forward to is the whining coming from r/eve. I think CCP Falcon ended his news article with a huge dose of sarcasm. "As always, the EVE community is renowned for its level headedness when changes are ported to Singularity for testing, and we expect that our pilots will understand that Singularity is a test environment, and that not everything that is tested there makes it to our live game environment!"